The Carovana features a nested set of three beautiful acacia bowls, each with its own tempered glass bowl (that nests inside each acacia bowl). Use the bowls separately as six distinctive pieces, or nest the accompanying glass bowl inside its acacia bowl counterpart when you want to showcase the beauty of the acacia, but prefer the convenience and washability that glass offers. 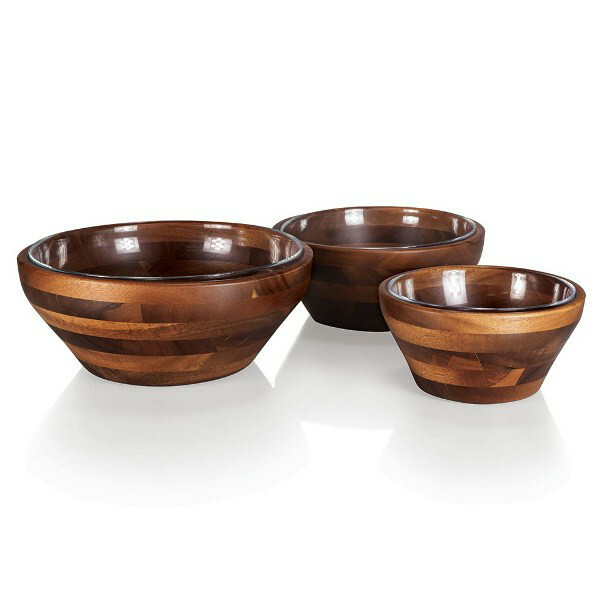 Featuring a nested set of three handcrafted acacia bowls and three tempered glass bowls, this versatile set lends rustic elegance to any table. Care Instructions:Surface wash only with a damp cloth. To prevent wood from warping and cracking, do not submerge in water. Hand wash knife and towel dry immediately after washing. Not dishwasher safe.